Hey all! So I quit doing monthly outfit round-ups in the fall for a number of reasons, and I also felt like I had to stop Weekend Fashion posts (at least for now...) partially because the weather was altering my fashion choices (and not for the better) and in part because there were some personal things going on that I have deemed off limits for the blog and I didn't want to be lying by omission. For the time being, I've decided to get a 'Brady Bunch' number of pictures from various vendors, styles, and brands and when that number is reached I'll do a round-up and share why I styled things the way I did and what I was up to in some of these outfits. 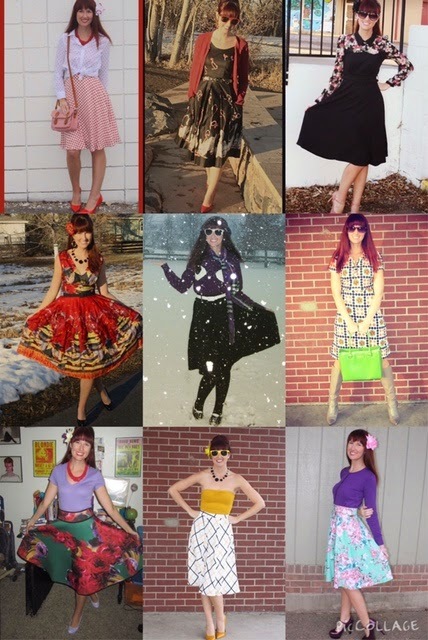 The first genre I hit 9 squares for in 2015 was ModCloth! While I own several things from ModCloth, I opted to only add to the squares less familiar brands or brands that I only have one or two pieces of clothing, but all are from ModCloth. I had been waiting and waiting and waiting to pair this polka dot skirt with my polka dot button down shirt! I've gotten super into mixing prints over the past year, but putting prints on prints is something I've been wanting to try. Adding this striped Forever 21 bag was a last second decision to add in some mixing of prints, and I think it paid off! These two dresses you can read all about right here. 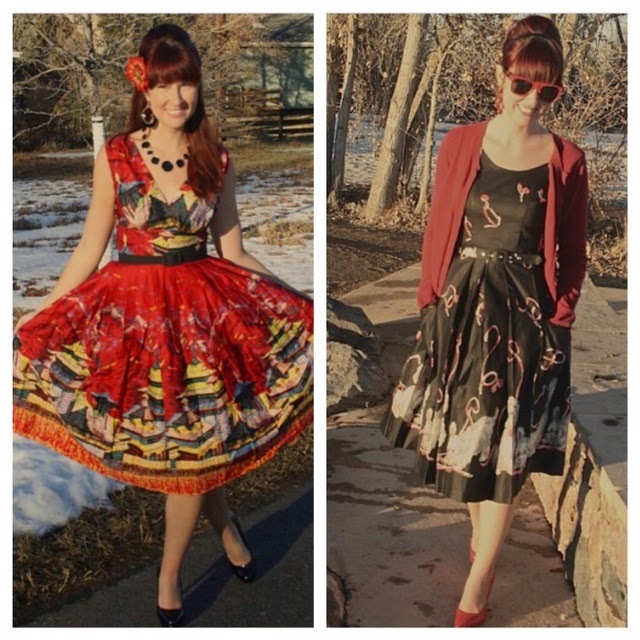 I included them in my ModCloth collage/round-up because they're the only two dresses from Retrospec'd I own...and I got them via ModCloth so it made sense all around. So this Collectif dress came in handy earlier last month because one of my best friend's grandmother passed away and I went to the funeral. As much as we as a culture hate to talk about death and all that comes with it, it is apart of life. While I will 100% wear this to other functions besides funerals, it is a good idea to have a few darker and classier pieces in your wardrobe that are still true to your style for the more somber occasions. This was the most out of the norm picture I've taken...but I think it paid off! I'm such a summer girl with bright colors, sundresses, skirts, and heels. 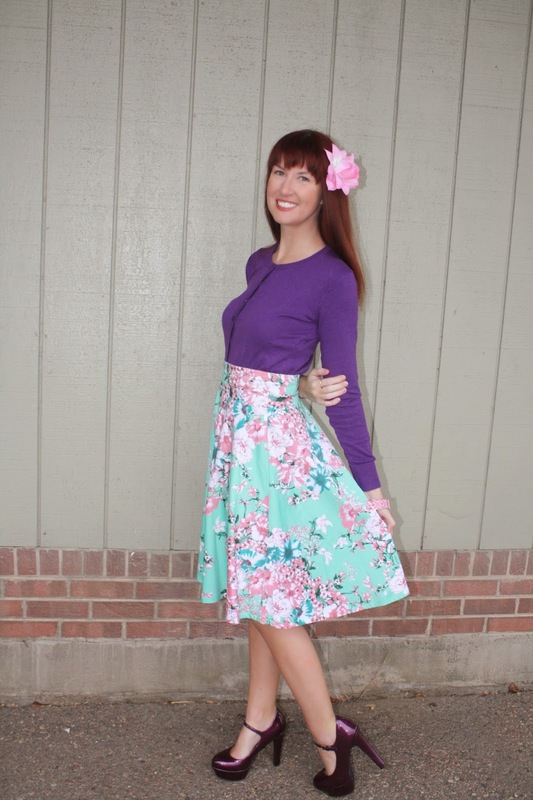 I had owned this Breathtaking in Tiger Lilies skirt for some time (read more about those skirts here) and had recently gotten this super fun Kling sweater (both pieces are from ModCloth). Denver weather is kind of schizzo so I was waiting for the right opportunity to debut this sweater. A huge snowfall hit somewhat unexpectedly so I decided to embrace winter and take my first ever 'while it's snowing' outfit picture. Initially I was going to wear black combat boots, but opted for these saddle shoes at the last minute when I wore a white belt to break up the outfit a little. Why am I wearing sunglasses?? Because it was snowing that hard that I was afraid I'd be blinking without them. It's also somewhat true to Colorado; while driving in snow during the day I often wear sunglasses because being that much closer to the sun (Mile High City-hey-yo!) makes snow that much more reflective, bright, and blinding. While I do love this photo, I wish I showed off the eyes more on the sweater or better focused on my ear muffs and scarf, but it really was really coming down and snow was rapidly accumulating in my hair so I had to call it good here! I love, love, love, LOVE this dress! I'm determined to find a Brady Bunch episode where Marcia, or at least Jan, wore a dress that's nearly identical to this! There's some beige undertones to this so I was excited to pair it these Calvin Klein boots that match perfectly. I also had a tan cardigan, but because I didn't really need it because the weather was warming up I opted to not be photographed in it. Within a week after the blizzard it was back up to 70+ degrees! This Moon skirt is kind of a heavier material, but it's so floral and bright I had to wear it on this seemingly spring day in January! The lavender in this skirt is subtle, but I decided to play it up with a matching tee and shoes. It was the perfect combination because I was outside most of this day and very comfortable. I love this skirt. But I haven't worn it as much as I thought I would because I'm having a surprisingly hard time styling it. Now that I've worn it before with black, and as you can see here with yellow, I think I'm going to try for blue, purple, red, or green next. I'm proud of myself for wearing a necklace here that matched pretty perfectly-it's one of my fashion blogging resolutions as jewelry is not second nature to me at all! And thus completes my first brand round-up! I'm excited about this series because I don't know which one I'll do next or when it'll be, so it keeps me on my toes! Happy Tuesday! So many wonderful outfits!! 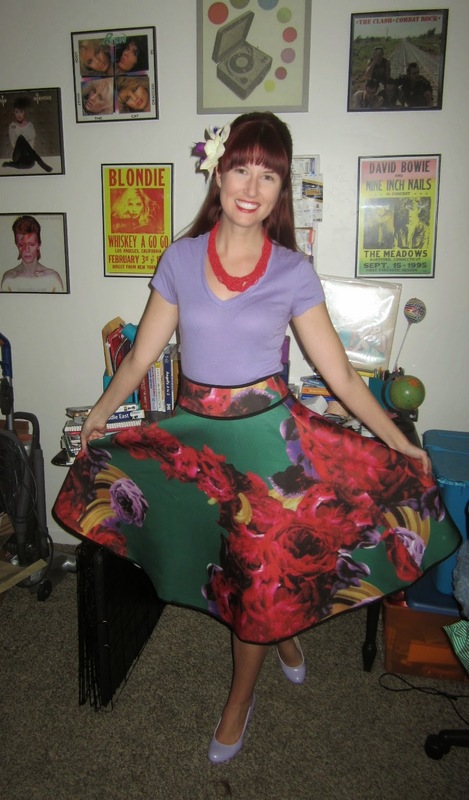 :) Love the Voo Doo Vixen skirt on you. I don't have anything of that brand as of yet. Also adore both Retrospec'd dresses on you. 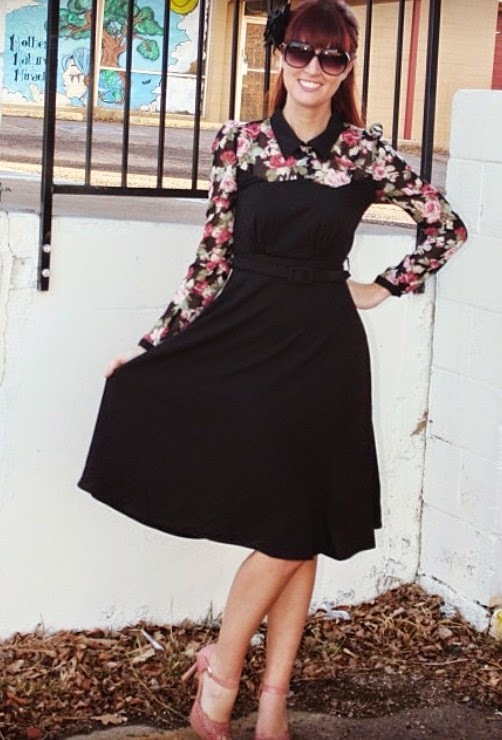 I haven't been seeing much lately on Modcloth that I'm into. I hope they start selling more bright coloured/quirky prints again soon! Sunday Vintage: The Wild West!